Was it a coincidence or luck? Perhaps a little bit of both was on our side this weekend as my nieces and I prepared a delicious spiced pear cake using a bundt pan. And to my amusement as I was drafting up this post, I discovered that today is National Bundt Day! This is the time of year when I bust out all of the warm spices (cloves, nutmeg, cinnamon, etc) and begin feverishly baking molasses cookies, gingerbreads, and other spiced desserts. YUM. I just love the aromatics and the deep warmth it brings to your home/kitchen when you’re creating such delights. Since pears are in season and were in abundance at the market, I picked up a few Boschs with the intention of creating a cake that would be great for breakfast. (Cake for all times of the day, I say!) I also took the opportunity to try out this recipe with my nieces, Nina and Stephanie. They are turning out to be quite the whizzes in the kitchen and have refined palates for their age. And in truth, they did most of the work with this cake with me just guiding them through the process. I’m a proud Auntie. The end results were just what I was hoping for. An extremely moist cake speckled with diced pears and perfumed with warm spices. Perfect with a huge cup of steaming coffee in the morning. With breakfasts like these (and wonderful nieces), perhaps I’ll make it through the chilly season after all. Preheat oven to 350 degrees. Thoroughly grease a large bundt pan. In a large mixing bowl, sift together flour, baking soda, salt, cloves, nutmeg, cinnamon, and granulated sugar. Mix in brown sugar, breaking up any clumps. Create a well in the center of the dry ingredients and mix in oil, eggs, vanilla extract and molasses. The batter will be quite thick. Fold in the diced pears being careful to not break up the fruit too much. Spoon the cake batter into the greased bundt pan and spread the mixture evenly. Bake for approximately 1 hour or until a tooth pick inserted in the center comes out clean. Let cool in pan for 20 minutes before inverting on to a plate. While cake is cooling, prepare glaze. Melt butter and slowly add confectioner sugar and cinnamon. Add apple juice (or water) and mix until combined. Strain the glaze to remove any potential lumps. Slowly pour over the cake while its still warm. I love the spices of the holiday season too! 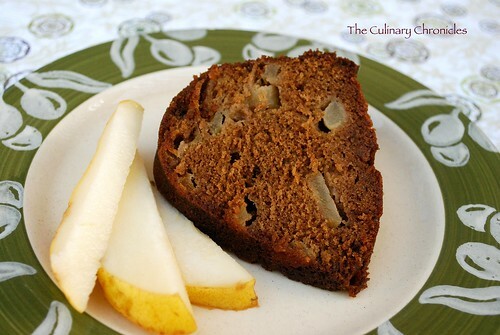 I’m all about cake for breakfast too…Yay, Spiced Pear Cake…YUM! The bundts around the blogosphere are all quite unique. Just remarked how pears need more love. And here you go with a pear bundt! Delicious. I love the pears. ..and it was and still is (1 1/2 slices left for tomorrow) great with cuppa java..
I’m dying to try this. The pears are in the kitchen and it’s so cold today that I would love to have an excuse to turn on the oven (There’s not much central heating where I live. Here in the south of Portugal people think of themselves as living in a warm, semi-tropical climate and seem to forget when constructing homes about November – early March which is usually cold (0-14 degrees centigrade) and always damp.) This is also part of the problem I face cooking. Like you, certain ingredients just aren’t available to me! The closest I can find to molasses here is english golden syrup which really tastes more of butterscotch than anything else. Do you have any suggestions? It’s not one of those products I’m really comfortable carrying back in my suitcase from my annual trip home. (Now dried chipotles, smoke flavoring, spices, that’s another story!) Thanks for any suggestions.